When Apple first released its original Maps client for iPhone, it introduced a fundamental change in how users approached maps. While Apple's use of Google's map data caused many to assume that the iOS Maps app was actually Google's design, Apple made an important change to the overall interface used by Google on the web. 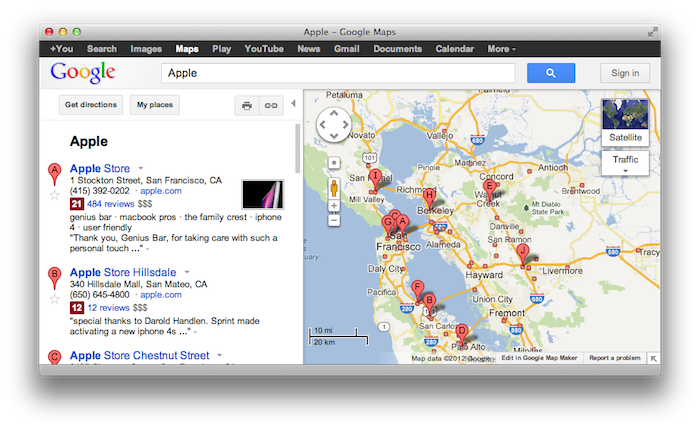 Google originally created its online maps product to entice web users to continue to use it for search. If you open a new browser window and go to maps.google.com, by default the map itself only takes up half the window, with the rest dedicated to Google's search results, including the paid ad placements that drive the company's business model. 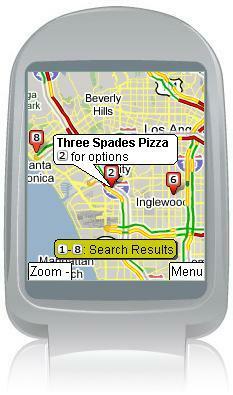 The original iPhone's built-in support for browsing Google Maps caused Steve Jobs' 2007 Macworld Expo audience to gasp and applaud at various points as he demonstrated graphically pinpointing search results, using the results to place a crank call to Starbucks, and to access road and satellite images from around the globe. Rather than being oriented around search listings and paid placement, Apple's iPhone Maps app presented a full screen map that invited direct manipulation via iPhone's multitouch screen, something Google had never done before in its own Maps for Mobile product for Java phones, which focused on search results. Apple's customers are the end users who buy its products, so Apple's iOS Map design was focused on delivering value to them, rather than presenting the textual search results that served Google's customers. To Google, the attention of users is the product being sold; its paying customers are the advertisers, not users. 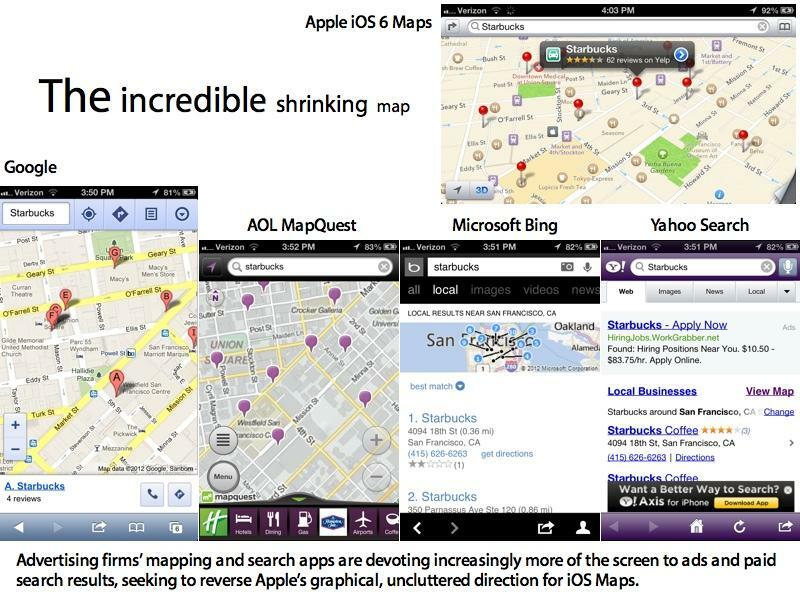 When Apple debuted the new iOS 6 Maps, it didn't launch a new advertising program built around ad placement and paid search placement. While Apple's iAd mobile ad network was designed to create interactive brand experiences to help third party developers monetize their apps, Apple doesn't use it in Maps or in any of its other first party iOS apps. That means Maps remains a hardware-supported feature of iOS devices intended to drive hardware sales, rather than being a copy of Google's business. Apple's focus with the new Maps was to provide a compelling, differentiated product, a business model that is much closer to that of Nokia and GPS vendors than it is to Google's ad-centric model. Since the introduction of Apple Maps app, Google and other advertisers have sought to remake online maps to focus on their search results. This is evident in Google's mobile web app, which continually reverts to presenting textual search results rather than just showing information on the map itself. Other advertising and search vendors, including Microsoft, Yahoo and AOL, similarly devote much of their online and web user interfaces to the links capable of driving traffic to their customers. Yahoo doesn't even show a map by default. It's therefore a very dangerous threat to advertisers like Google to see Apple join Nokia in introducing its own map service, because if end users are getting information without their help, there's little opportunity left to make money. Google has been doing well competing against paid software and services with its own ad-supported software and services. It's now facing competition from Apple's hardware-supported software and services. While Google formerly enjoyed an exclusive partnership with Apple on iOS that allowed it to focus its competitive efforts against Microsoft, Nokia, Palm, RIM and others in the mobile space, it's now competing directly against Apple, too. 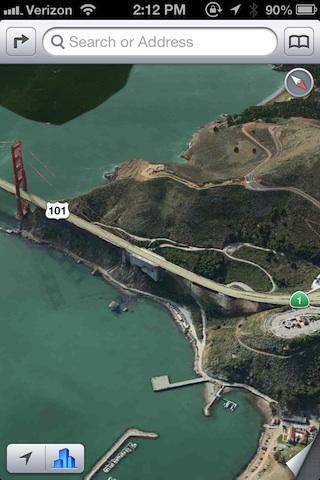 At the same time, Google isn't just competing against Apple's new iOS 6 Maps app. It's also now competing against everyone else in the iOS third party ecosystem, on the same, relatively level playing field. Since the introduction of iOS 6, Apple's new Maps application and its underlying cloud service supplying maps, 3D renderings, traffic and local search have been targeted by a hailstorm of criticism unmatched in the historical reception of comparable efforts to relaunch mobile software, including Palm and HP's webOS, Microsoft and Nokia's Windows Phone, and Google's Android 3.0 Honeycomb. Rather than being greeted as a fresh new contender to professional GPS apps or the leading mobile mobile mapping software from Nokia and Google, Apple's new Maps and turn by turn directions service was ridiculed and berated for being flawed with 3D perspective glitches, missing map detail, and widespread reports of location errors. Our initial look at what's wrong with iOS 6 Maps found that Apple does indeed have some real issues to address, but we also observed that the majority of the problems being reported seem to be insignificant visualization errors that can simply be turned off. Consumer Reports agreed. 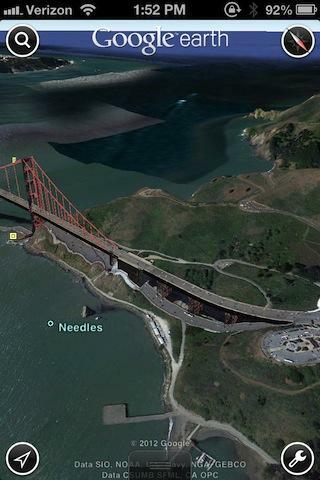 Google's Earth program has the same types of visual errors in its 3D renderings (below, Earth's view of the Golden Gate Bridge versus Apple's Flyover version), but that doesn't prevent it from being a useful tool. Since our initial look at iOS 6 Maps, Apple's chief executive Tim Cook offered both an apology for the inconvenience posed by the rough iOS 6 Maps transition, and an invitation to iOS users to try alternative mapping titles in the App Store, as well as the mapping services from Nokia and Google available as web apps. This changed the conversation entirely, as up to that point, commentators were describing iOS 6 Maps as being locked in a fierce, dramatic battle for supremacy with Google Maps. In reality, Apple has leveraged the entire iOS ecosystem to replace Google's former position as iOS's exclusive supplier of maps, directions, traffic and related information. Google can enter in that market, but it won't ever again have its exclusive position as being the default map service for the hundreds of millions of iOS users.